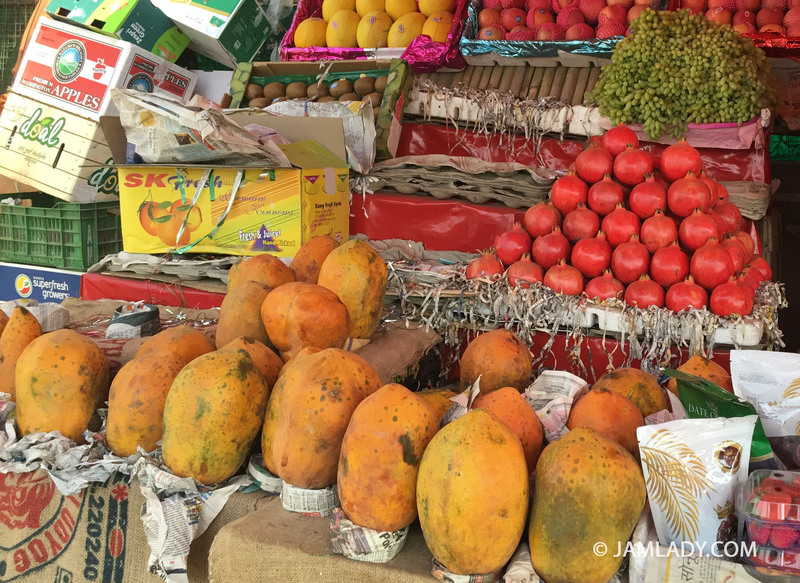 Guavas, papayas, exotic fruits, vegetables, and endangered species! 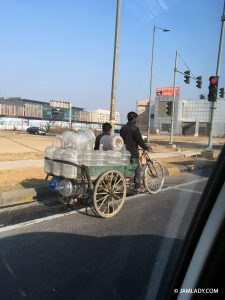 Driving from New Delhi Airport to Marriott hotel. 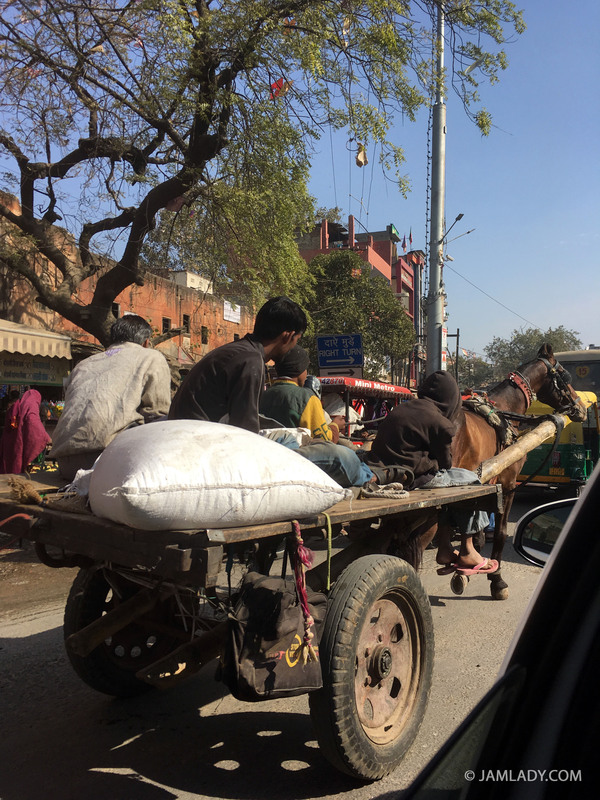 Tim and I flew to New Delhi, India without a planned itinerary. We had booked a discounted luxury suite at the JW Marriott Hotel for the first night. In India, taxes are often quite high on luxury hotels, sometimes upward to 48%, since taxes in some areas are based on the basic rack-room rate, regardless of any discount for the room. Such was the case for our discounted JW Marriott Hotel room. We usually recommend the boutique-hotel option when traveling in India so enlightened souls can “tour like a local.” Boutique hotels in India will provide the best cultural experience and are a “best buy!” On this trip, we stayed at 2-, 3-, 4-, and 5-star hotels to experience the difference between the various starred accommodations. Although the JW Marriott Hotel is supposed to be a top, luxury hotel, we found it to be our least favorite hotel of the trip, and would recommend traveling further from the airport for the best New Delhi experience. Domestic air travel in India can be hectic. After arriving at the airport in the morning, we found it hard to secure a flight to Jaipur. 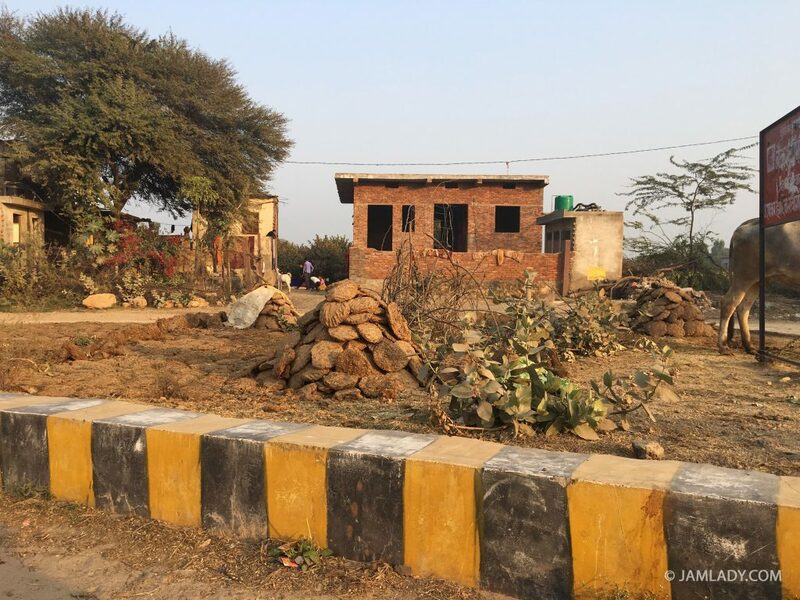 Our US credit cards would not work on any direct-airline-booking sites, so we headed to the airport to try and secure a seat to Jaipur. We missed our first flight. We tried one airline after another and had no luck getting any air tickets because of full flights. We ended up giving up on flying to Jaipur and found out that now our luggage was lost. We waited until midnight at the airport to get our “misplaced” luggage back; then we decided to call a travel agent for options. We weren’t going back to the Marriott hotel. Sweet mango lassi at road stop. We located a well-rated business online called India by Car Chauffeur. We debated about calling at 12:01 AM, but the ad said “24-hour service.” We figured we would get an answering machine, but the call was answered by a half-asleep man named “Kul.” After we apologized for the late call and explained our situation, he said, “No problem!” “Want a car and driver to drive you to Jaipur tonight?” Four hours later we were in Jaipur sleeping in a narrow, but comfortable, bed at the quaint Dera Rawatsar Hotel at a cost of $91 US (5898 rupees) for room, taxes and a British/Indian influenced breakfast. Kul also provided a car and driver for 6 days at a cost of $462 US. 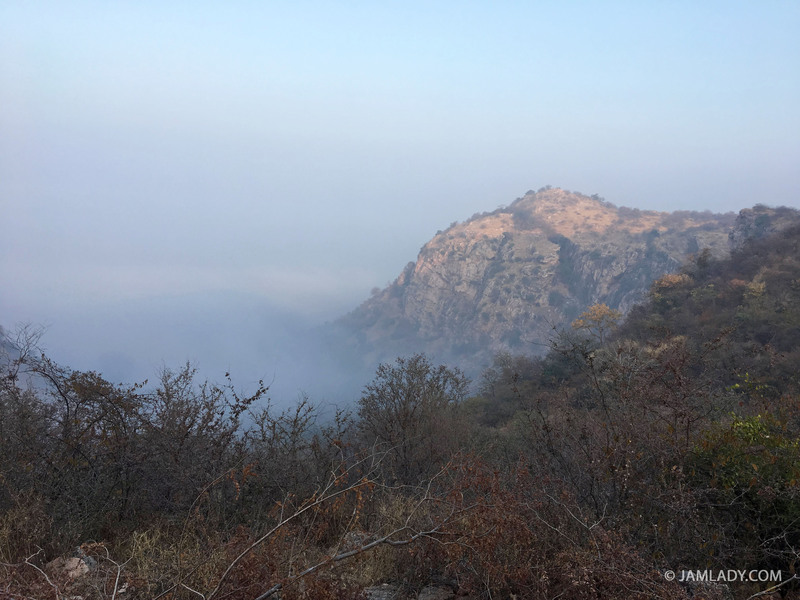 Mid-morning, we road from Jaipur to Ranthambhore. 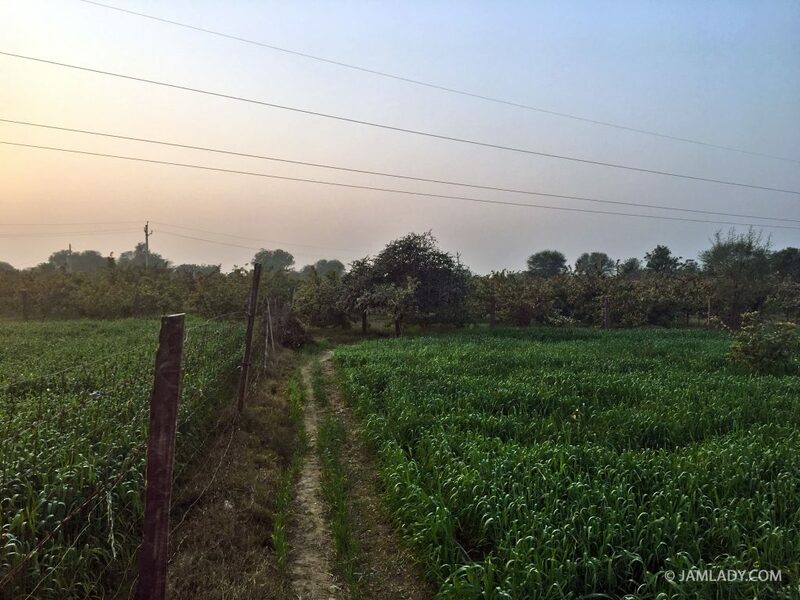 In route, we visited farms growing berries, guavas, wheat, cotton, tobacco, citrus, hot chilies, methi (fenugreek) (Trigonella foenum-graecum – a semi-arid leaf and seed crop with the sweet taste of maple syrup), and cumin (spice, dried seed of Cuminum cyminum). Many regions of India produce guavas, Psidium guajava L. Two crops per year are produced and guavas are evidently grown where the soil will not support citrus fruits. 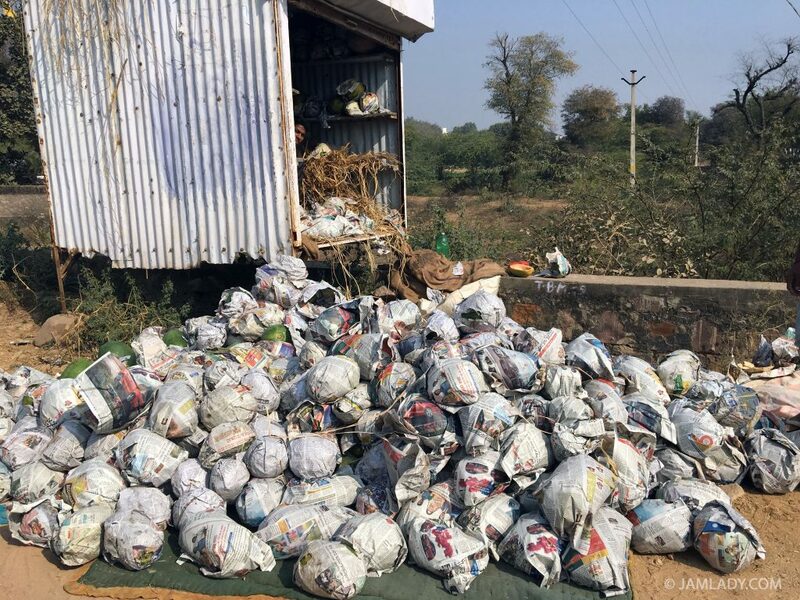 Twenty percent of crops in the state of Madhya Pradesh have to be irrigated, and the guava orchards we saw along the road to Ranthambhore were irrigated. States in the south of India produce the most fruits, like mango, apple, pomegranate, sapota, guava, banana, pineapple, grapes, litchi, papaya and citrus, but the state of Madhya Pradesh, where Ranthambhore is located, produces “rabi or winter crops of barley, wheat, pulses , and oil seeds. Pulses are nitrogen-fixing crops and India grows many different types like chickpeas or green gram [mung]. Kharif crops or summer crops like bajra (pearl millet), pulses, jowar (sorghum), maise, and ground nuts are seeded in June and July and harvested in September and October. 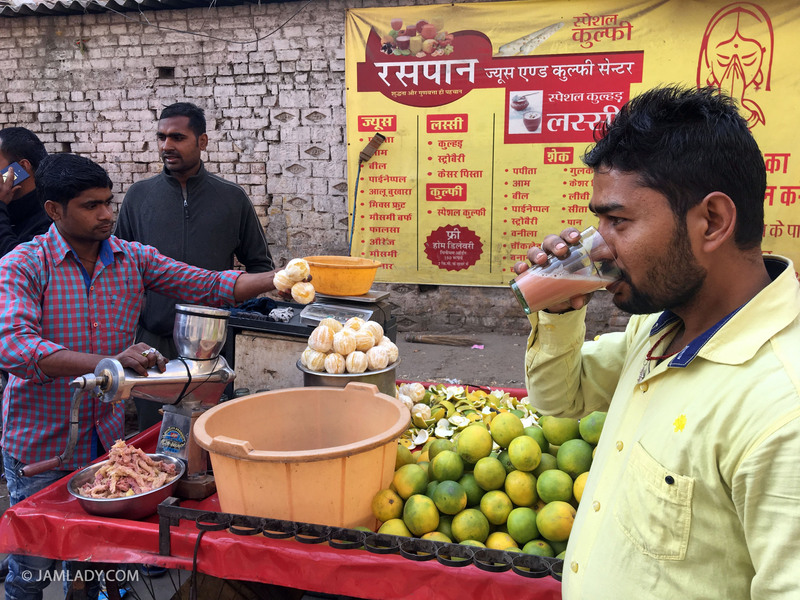 But in the areas we traveled, guavas were everywhere and in many served foods. Our Jaipur hotel served guava preserves or mixed fruit/guava preserves daily. No wonder guava production in India is second only to their citrus production. 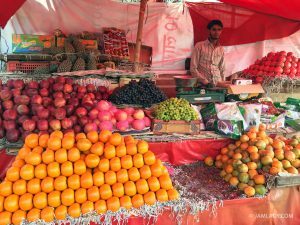 For more information on fruits grown in India, please open this link. 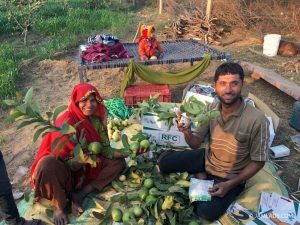 Guava farmers we visited on the main road to Ranthambhore. 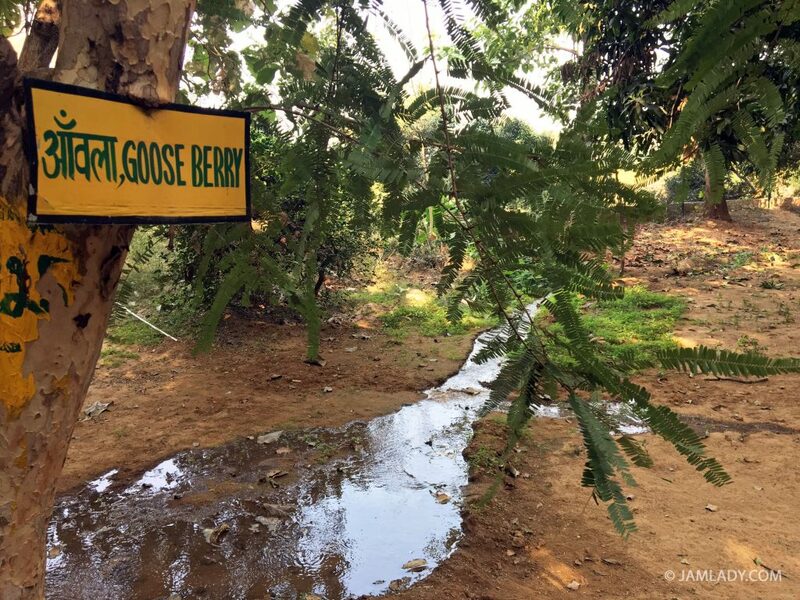 We visited one family’s guava orchard where they showed us their essential irrigation system. We were greeted gleefully and offered refreshments and ripe guavas, as if we were long-time friends. Guava trees are typically grown with wheat plantings in between the guava plantings, allowing for crop rotation and sufficient water for all. Orchards are often on small plots of land, with entire families working to irrigate, pick, and wrap the fruit for shipping. Irrigation pipes to the right of the road; wheat growing. Watermelons for sale on the road to Ranthambhore, India. Sun-dried, circular fuel of cow droppings and straw for cooking and heating. 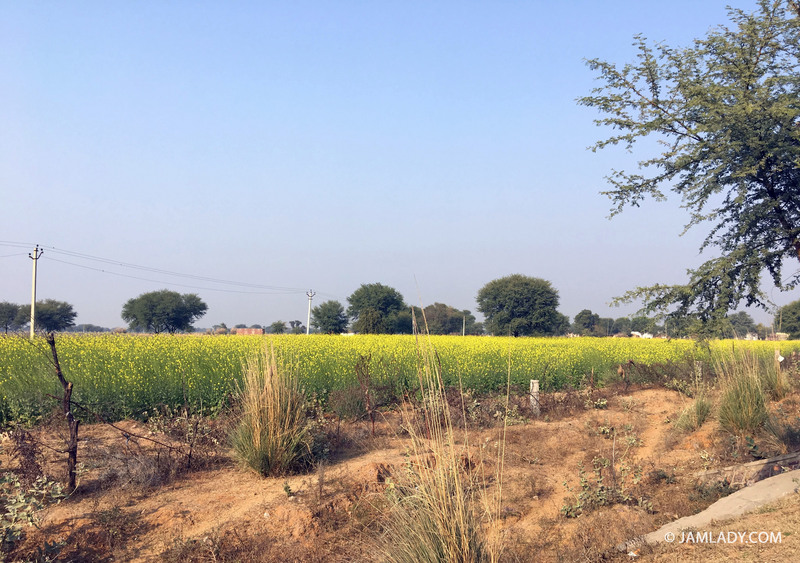 Fields of mustard growing near Ranthambhore. 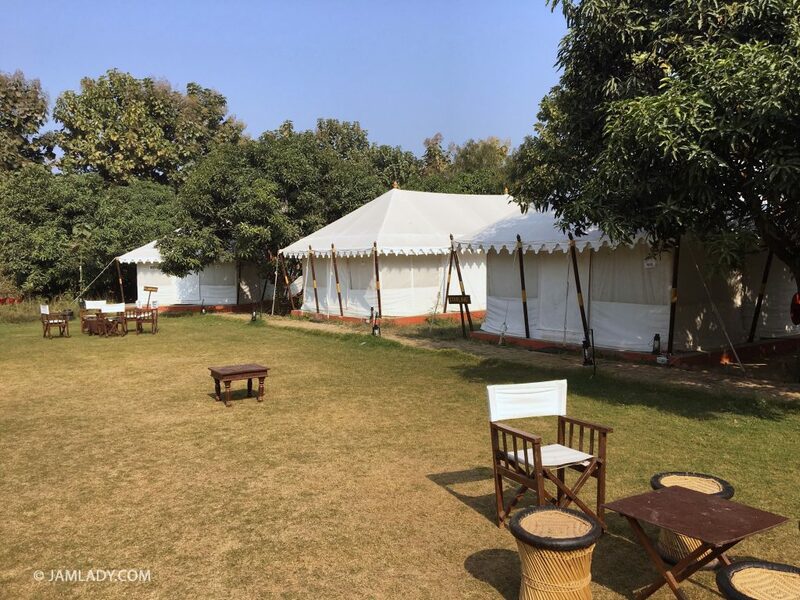 Our safaris in the Ranthambhore National Park were arranged by “Kul,” but one can also get the desk clerks in Ranthambhore hotels or tent camps to book space for you. There are morning, afternoon and night safaris. We did a morning safari on day 3, and an afternoon safari on day 4. Both were wonderful. We tracked several tigers in our jeep and heard them roar, but did not see one. However, we did see a very rare and elusive jungle cat, other creatures, and copious flora. 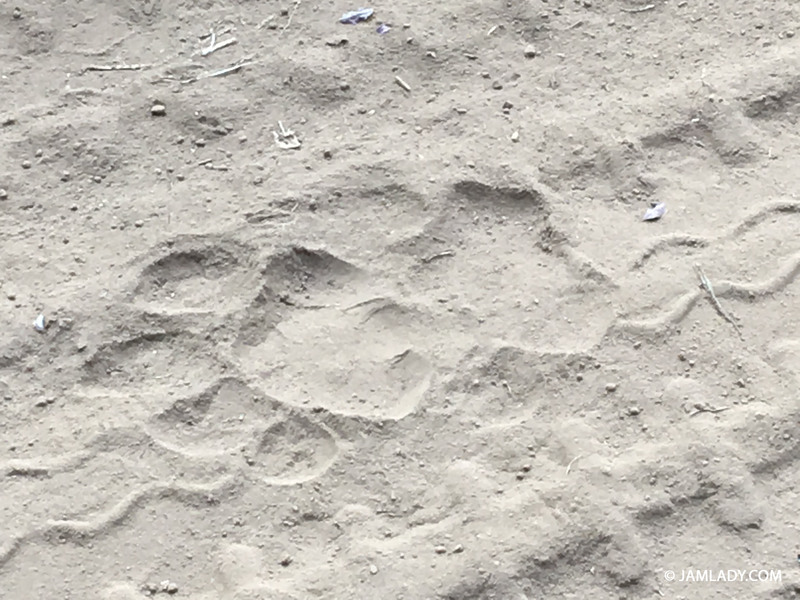 Tiger paw print, tracking tigers in Northern India’s Ranthambhore National Park. Bengal tigers have been protected there since 1973. 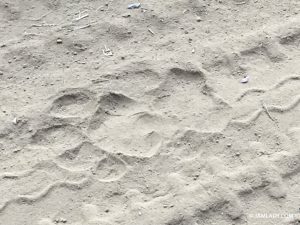 In the park, one might see a Bengal tiger, Sambar deer, mountain lion, Muntjac deer (known as barking deer because they bark like a dog), sloth bear, jackal, chital (spotted deer), Indian leopard, striped hyena, mugger crocodile, southern plain grey langur, gazelle, Indian Hare, porcupine, jungle cat, chinkara, mongoose, nilgai, wild boar, monitor lizzards, marsh crocodiles, monkeys, or any one 272 species of birds, and 300 species of flora like banyan, dhok (most noticeable), mango, pipal, imli, kadam, Khair, khajur, neem, mahua, kakera trees and blackberries. The largest banyan trees in India are located here. Local birds include black-naped monarch, stork-billed kingfisher, brown shrike, mottled wood owls, golden-fronted leaf bird, blue-beard bee eater, lora, green sandpiper, wooley-necked stork, purple sunbird. chestnut-bellied nuthatch, long-tailed shrike and many more. 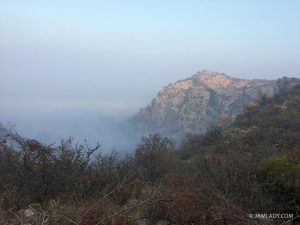 Abarar Place and Jungle Camp is located in Ranthambhore and has quite a few rare fruit trees which are labeled. Many were tall and shaded, so they were difficult to photograph, but Karonda, Carissa carandas, was among them. Karonda has small fruit, turning from green to red to finally black and shiny when ripe. Seeds are flat and brown. Unripe fruits are made into pickles and ripe fruits are used for medicines, dyes, tarts, puddings and jellies. Gooseberry Tree or Phyllanthus emblica (embic, emblic myrobalan, myrobalan, Malacca Tree, or amla) at the Abrar Palace and Jungle Camp. The fruits of this tree are edible. Madhopura Village, (population = 987 in 2011, literacy rate = 71%), washing clothes with water from a tank, as their pond water was totally covered with algae. We also visited nearby Madhopura Village. The women were happily washing their colorful clothes by their community water tank. Their streets were so narrow only motor bikes could pass in many places—rural, village life was in fully display. Indeed, we had become show pieces for many curious villagers, because most villagers had seen few Americans before, or maybe they had never seen any. No one spoke English there. Luckily, we were taken to this village because our private, English-speaking driver enlisted the expertise of a local citizen. In the afternoon we drove back to Jaipur. Hand appliqued quilt, shop in Ranthambhore. 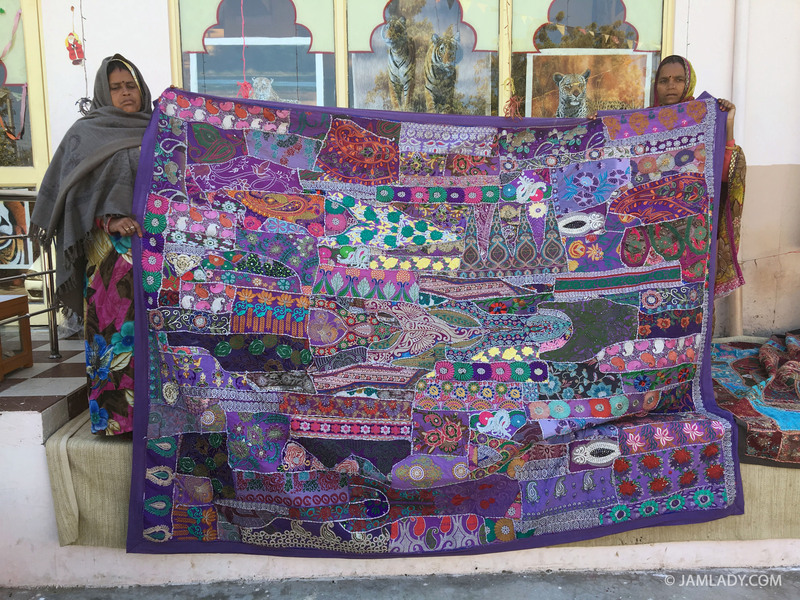 Noticing the wonderful quilts on our beds at the Dera Rawatsar hotel, we asked where they had bought them, so the owner arranged for us to go to Sodhi Textiles and Home Furnishing in Jaipur. 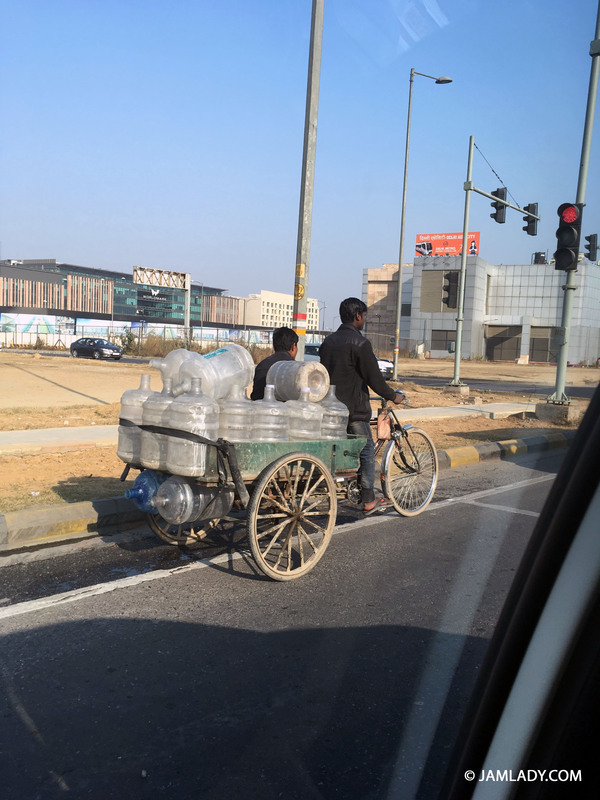 I ended up purchasing 5 quilted bedcovers, 3 reverse-appliques table clothes of organdy, and 3 wall hangings for about $493 shipped to my door in Crystal Lake, IL. One might easily pay $493 for one of these quilts in the US. 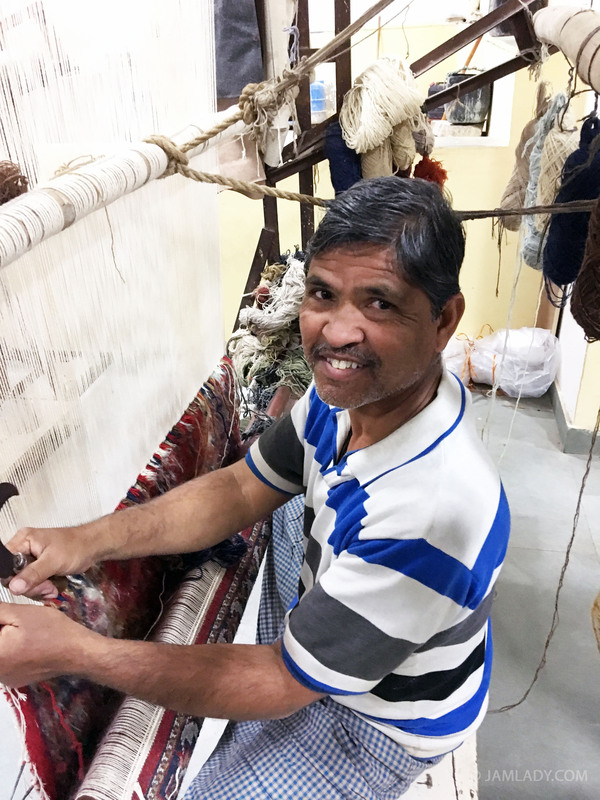 Weaving wool rugs at Sodhi Textiles. Wool are dyed there with many natural dyes from indigenous plants. After shopping. we drove by many fruit and vegetable markets. 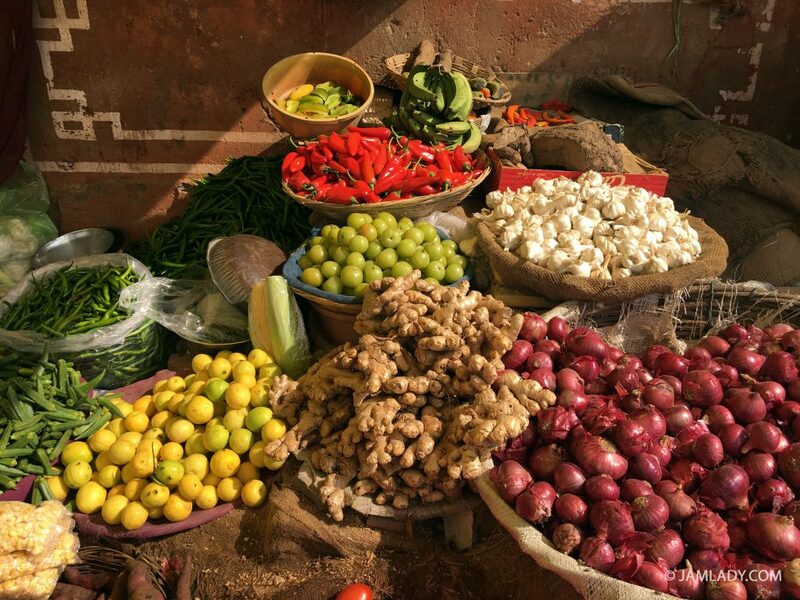 There were arabi (mustard leaves), haldi (a tuber/root similar to turmeric – priced at 80 rupees per kilo), karalla (bitter cucumber), lokji ( opa squash), muli (white daikon), black and red gajar (black and red carrots – 30 rupees per kilo), nimbu (ginger), pyaz (red onion), mukka (baby corn), sakarkund (sweet potato), and more. We saw bael fruit for sale, which grows in Gujarat town as a wild, indigenous tree. 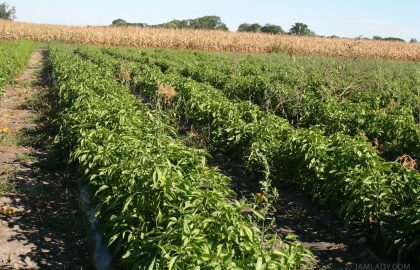 We were told there were no established bael orchards, as it grows wild. Bael (Aegle marmelos Correa) has fragrant flowers and all parts of the tree (stems, bark root, leaf, flower, seed oil and fruit in all stages of ripening) are used in Ayurvedic medicines. 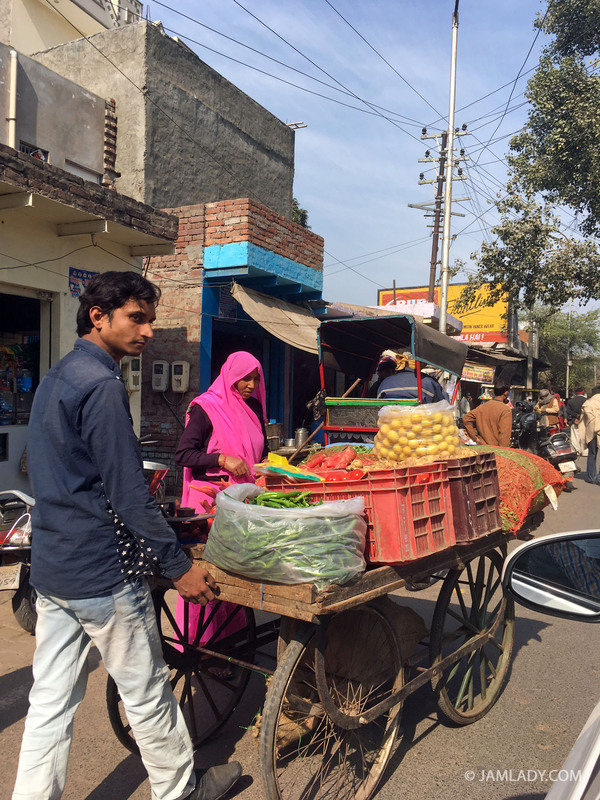 Street vendor in rural India. 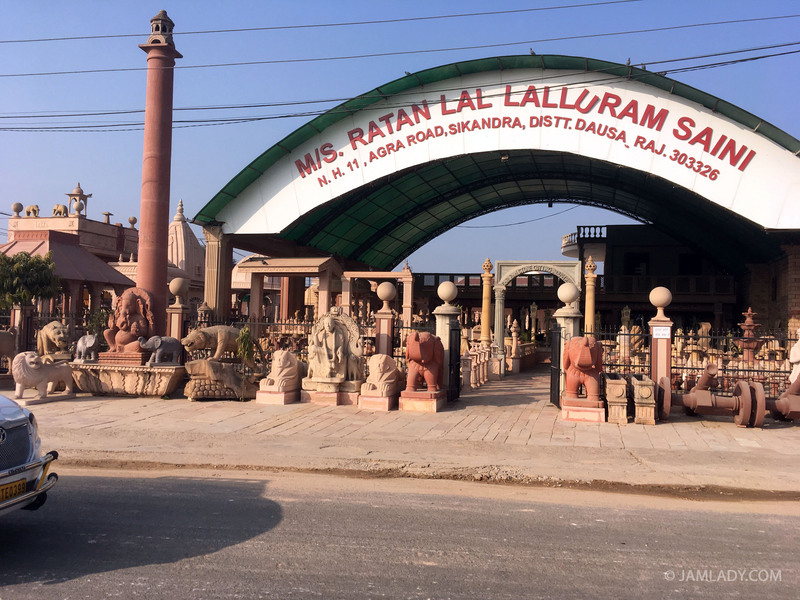 We then continued on to Agra, India, also passing by many rock monument companies which lined the main road for miles. View from the backside of the Taj Mahal showing the partly built foundation of the Black Taj. Extensive gardens with fruit trees in this area, but most trees are not well identified. 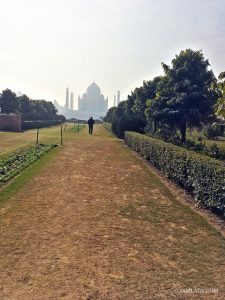 In Agra, we went to see the Taj Mahal, but instead of doing the normal tourist route, we went to the back side of the Taj Mahal. The back side includes a fruit park and a view of the “uncompleted” Black Taj Mahal. If we had it to do again, we would have skipped Agra totally and gone to more fruit farms around Jaipur and then headed back to New Delhi or opted go further south in India. But then we are nature lovers, not monument lovers. Note: the inside of Taj Mahal can be viewed online, despite the ban on photography there. 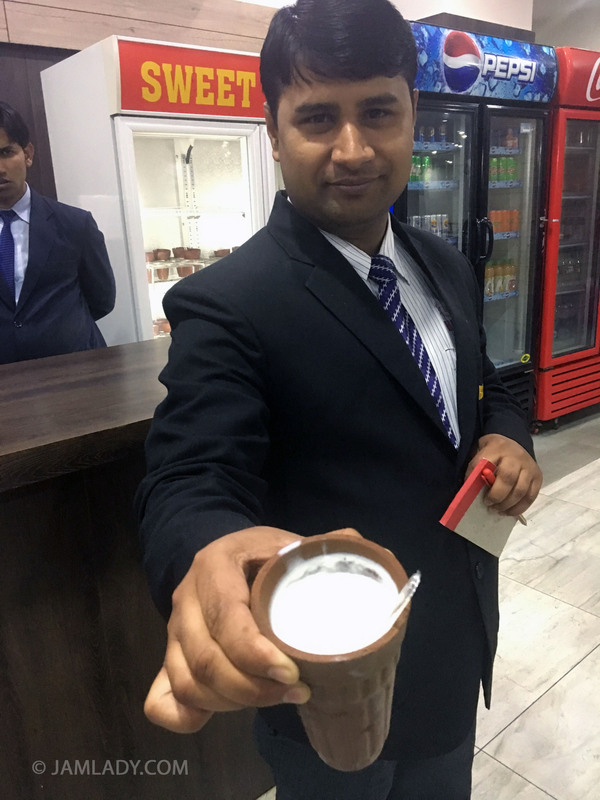 We arrived back in New Delhi and stayed at the Shanti Home Boutique Hotel which was located in a beautiful and ritzy district where the ambassadors had their homes. This hotel had a tandoori kitchen on its roof and all of the rooms were special and unique. Escalated hotel taxes similar to those charged at the Mariott hotel were not charged by this hotel, and it is also relatively close to the airport. Evidently taxes vary by district. Lesson: go where the ambassadors go. 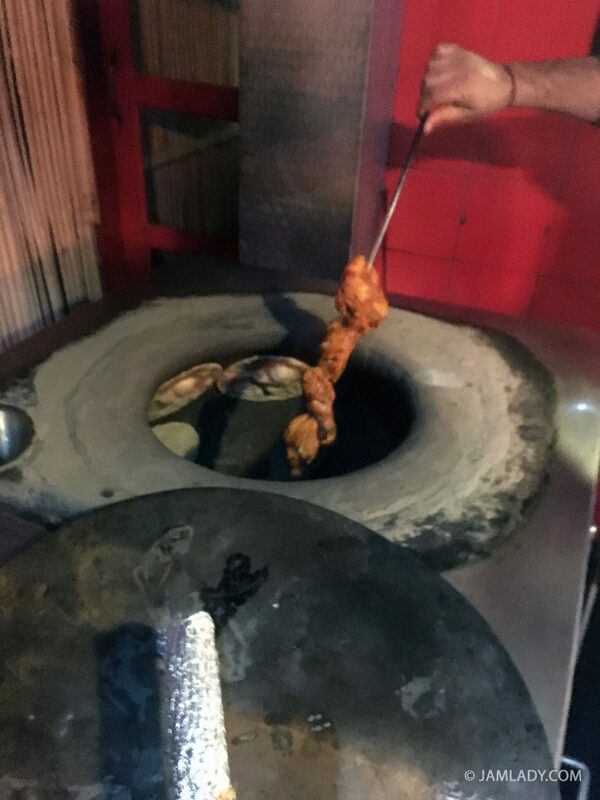 Tamdori chicken and naan baked in a tandoori oven. 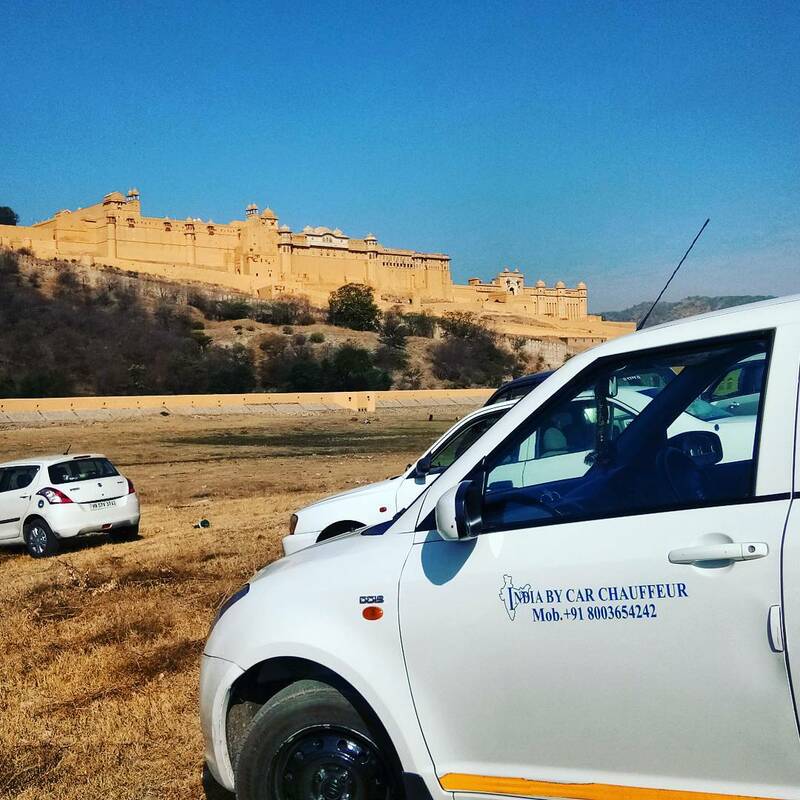 RECOMMENDATION: India by Car Chauffeur (phone: +91 8003654242) can arrange customized trips for anyone who might like to visit India. This award-winning company is highly recommended. 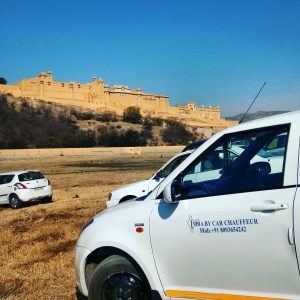 India by Car Chauffeur makes travel in India effortless, fun, and inexpensive. 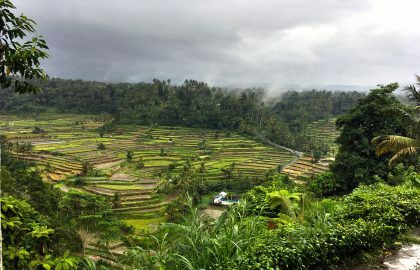 One cannot underestimate the value of private and individualized travel with your own native, English-speaking driver and guide.